Nico Budi Darmawan Tan - Simple Outside, Complicated Inside. 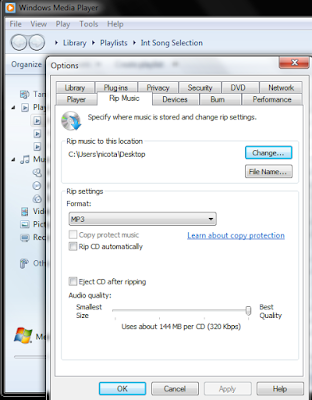 : How To Convert a CD Audio Track into an MP3? How To Convert a CD Audio Track into an MP3? Open Windows Media Player, maximize the window and click on the Switch to Library icon. Right click in the area immediately above the Search box until you get a drop down menu. In the Rip Music to this Location, choose where you want your music to be copied to. In Rip Settings, click MP3. Click on Learn About Copy Protection and read warning. Click on Eject CD after ripping. Select the Audio quality you would like (I recommend highest quality, it sounds way better!). Insert the CD you want to copy. Select the audio track or tracks you want to copy. If all audio tracks are selected, uncheck the box for all files and just select the ones you want. After your audio track has been copied to your computer, the CD will eject automatically. Search for your new mp3 in the file location you selected in step 4. Once you find it you may have to rename it with the artist name and song title if it was not copied from an original CD.